On March 25 and 26, in anticipation of the forthcoming election and the anniversary of the Great March of Return, Israel pummeled Gaza with dozens of airstrikes, instilling terror in 2 million Palestinians. On Saturday, March 30, tens of thousands of Palestinians are planning to walk toward the Gaza border to commemorate the March 30, 2018, launch of the Great March of Return. For the past year, during the weekly protests, tens of thousands of Palestinians have demanded an end to the Israeli blockade of Gaza and the right to return to their homeland. In response, Israeli forces have engaged in violent and illegal repression against demonstrators. On March 18, the United Nations Commission of Inquiry on the 2018 Protests in the Occupied Palestinian Territory, convened by the UN Human Rights Council, issued a 252-page report of its findings on the Great March of Return demonstrations. “We present this comprehensive report with an urgent plea to Israel to immediately ensure that the rules of engagement of their security forces are revised to comply with international legal standards…. The excessive force that took place on 30 March, 14 May and 12 October 2018 must not be repeated,” Commission Chair Santiago Canton told the Human Rights Council. Immediately lift the blockade on Gaza. The Commission’s report will be forwarded to the ICC. The following January, Bensouda opened a preliminary examination into the situation in Palestine. In a preliminary examination, the Office of the Prosecutor determines whether there is sufficient evidence of crimes of sufficient gravity falling within the ICC’s jurisdiction, whether there are genuine national proceedings, and whether opening an investigation would serve the interests of justice and of the victims. 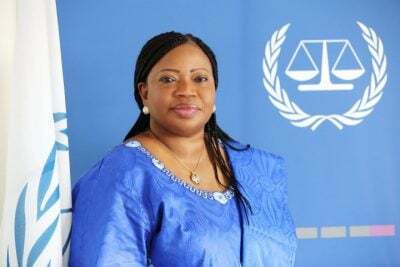 The petition from the International Association of Democratic Lawyers urges Bensouda to take the next step — from a preliminary examination to a full investigation into Israeli crimes against the Palestinian people. In an investigation, the Office of the Prosecutor gathers evidence, identifies suspects, and asks ICC judges to issue an arrest warrant or a summons to appear. “Complementarity” means the court will take jurisdiction only over people whose home country is unwilling or unable to genuinely investigate and prosecute. Israel has demonstrated its unwillingness to mount an impartial investigation into Operation Protective Edge. In August 2018, the Israeli military absolved itself of any wrongdoing in that operation. The lawyers’ petition was inspired by the International Association of Democratic Lawyers’ previous international call for lawyers to support the campaign to free Nelson Mandela in the 1980s. Just as that campaign “proved to be for those living under Apartheid in South Africa,” the current petition “is an essential first step in securing equal justice under law” for the Palestinian people. Marjorie Cohn is professor emerita at Thomas Jefferson School of Law, former president of the National Lawyers Guild, deputy secretary general of the International Association of Democratic Lawyers and a member of the advisory board of Veterans for Peace. Her most recent book is Drones and Targeted Killing: Legal, Moral, and Geopolitical Issues. She is a frequent contributor to Global Research.